Flip Flops – Are they any good for your feet? 03 Jul Flip Flops – Are they any good for your feet? Book in your complimentary flip flop check to make sure you are Flip Flop Fit for summer! Summer is here, we’ve been basking in a scorching heatwave in the UK and the schools break up this month so many of us will be heading away on holiday. Time to get out the shorts and dust off those flip flops then right? Well think about the flip flop front. Extended use of flip flops can actually be quite bad for your feet and problematic for your posture. The design of the flip flop means that having the straps only with no heel strap can make it difficult to keep them on, so we tend to curl up our toes to grip when walking. This unnatural movement causes tension and pressure through your toes and tendons and muscles of the sole of the foot and lower leg which can result in fatigue and cramping. Over-stretching of these muscles and tendons can cause chronic conditions such as plantar fasciitis which is a sharp pain in the sole of the foot when walking as well as inflammation of the connective tissues that stretch from the ball of your foot to your heel. Most standard flip flops have thin soles and offer little arch support which can cause the wearer to alter the way they walk and over pronate or flatten their feet. Shoes that do not offer proper arch support can lead to biomechanical problems which start from the feet and work their way up. This, in turn, can lead to areas of pain from the joints of your foot and ankle, as well as in the calf muscles, knees, hips, lower back, shoulders and neck. If you think of your feet as providing a foundation for the rest of your body, it stands to reason that wearing footwear which causes you to alter the way you walk, roll your foot and curl up your toes can then have a knock-on effect further up the body since everything is interconnected. We are not saying NO to flip flops as flip flops are fashionable, very wearable and perfect footwear if you’re heading to the beach or taking a short stroll to the swimming pool. If you’re going to be on your feet for longer –sight-seeing, taking a longer walk or a wander around the shops then wear a proper shoe with decent support such as a pair of trainers. Gradually increase the time that you wear flip flops to give time for your feet and body to adapt. So don’t go from zero time to all day. If you get tension in the sole of your feet, massage your feet with a massage ball, book a massage for your feet and lower legs and cut down your flip flop wearing time. 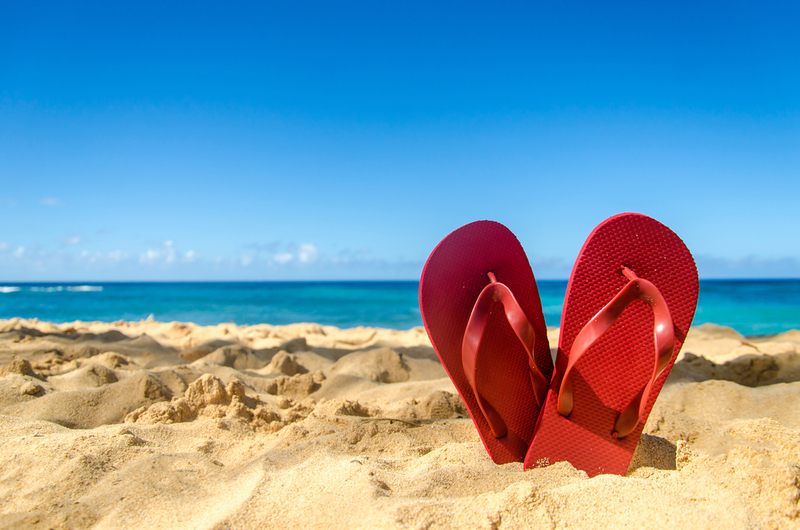 At N8 Health we want you to have a great holiday which is pain free so we are offering a complimentary flip flop check for the months of July and August where we will perform a 5 min check of your lower extremities as well as your overall posture to see whether you are flip flop fit for summer. We also offer massage should your lower limbs need some more attention. Call 020 8445 4355 or e mail contact@n8health.co.uk to book in your complimentary flip flop check today.